New Relic, the application performance monitoring startup, plans to announce Wednesday at its FutureStack conference that it has acquired Barcelona-based startup Ducksboard and is unveiling a raft of new products. Financial terms of the acquisition were not disclosed. Ducksboard is an eight-person company that can hook into different cloud services like [company]GitHub[/company], [company]Salesforce.com[/company] and [company]Twitter[/company], consolidate their data and convert it into a dashboard that a user can configure. With Ducksboard, [company]New Relic[/company] now has a Barcelona office and access to the startup’s technology that allows it to integrate with other data stores, said New Relic CEO Lew Cirne (pictured above). 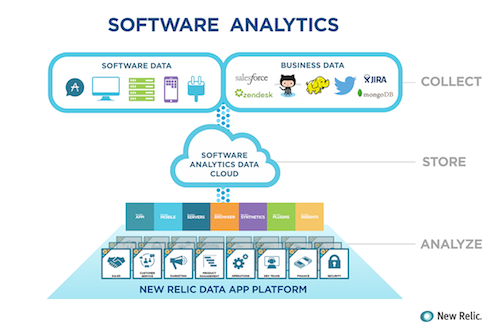 Regarding its own lineup of services, New Relic is rolling out the ability for business users to create their own applications to analyze and interpret the data New Relic collects. For example, a customer support team member should be able to easily build an application based on the organization’s gathered data that could help the rest of the team discover why customers are may be experiencing particular problems, explained Cirne. This new feature should be available in 2015. “In the past, customers would send half-a-dozen developers to build an app,” said Cirne in regard to how users with limited development experience can craft helpful internal applications using the New Relic interface. New Relic Browser is available to the public as of Wednesday and New Relic Synthetics will be released later in the quarter.